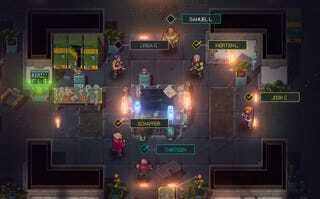 Halfway is a turn-based strategy game set on a huge starship crawling with zombies. Think XCOM, with a dash of Dead Space, only with gorgeous 16-bit-inspired visuals. I grabbed it earlier today and can't stop playing. Unlike a more traditional turn-based game, this isn't just a straight tactical exercise; in between combat engagements you and your crew can explore the ship RPG-style, scrounging for supplies and better gear. Below is a little let's play vid by Gamasutra's Mike Rose that walks you through the basics. You can get Halfway from Steam for $13.